While some people in some countries work to live, in America we live to work — and we spend 40+ years putting in 40+ hours a week on the job. You can imagine then, over the course of four grueling decades answering to the The Man, we're susceptible to experiencing symptoms of burnout. To avoid this exhausting byproduct of a seemingly never-ending grind, consider these stress-relieving (and sanity-saving) hacks. I understand that not everyone is as organized as I am (it's been a point of contention among coworkers in the past), but I stand by my usual suggestion to plan your work week in advance so you know what to expect over the next five days. In doing so, you'll be able to handle surprises much more gracefully without feeling an onslaught of pressure. Personally, I plan an entire month of projects, which has worked very well for me since I started my own business more than six years ago. With this calendar in place, I can see the full scope of work, cross items off as I finish them, and move projects around to make space for additional items or allot time that I need to relax and recoup. To-do lists are helpful, but you can quickly overwhelm yourself if you pack too much in. If you start to get that sinking feeling, revisit the list and decide which items are musts and which can be put on the back burner. Ask yourself, does this need to be done right now or can it wait? Prioritizing your to-dos will help lessen the stress and declutter your mind so you can concentrate fully on the issue at hand. All day, everyday, we're inundated with all types of communication and media — news, ads, e-mails, texts, digital documents — that can wreak havoc on our ability to concentrate. Simplify your work life a little more by taking steps to streamline or eliminate distractions, like unsubscribing from nonessential e-mails, putting mobile and social media conversations on mute for a period of time, organizing your hard and digital files, and keeping the amount of time-sucking meetings to a minimum. 4. Know When to Say "No"
In an effort to impress the boss with our go-get-'em, team-player attitude, we often say yes to everything that comes our way. Big mistake. Being a "Yes Man" (or Woman) can result in dire consequences, like biting off more than you can chew, which in turn can affect your productivity negatively. In that case, you'll look like you can't handle the workload — and that won't bode well for advancement opportunities. Thus, learn how to say no. If you're already at capacity, let your superior know. Decent bosses will understand and help you find the balance. 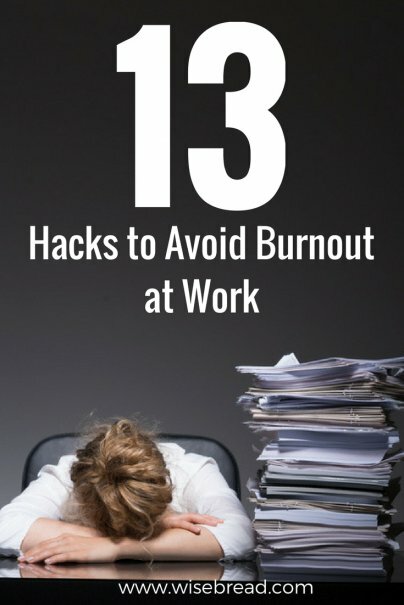 Stay with me here; this is one of the more interesting ways to avoid burnout at work that I've heard. Dr. Emma Mansour is a licensed psychologist who has seen her fair share of clients experiencing symptoms of work burnout, and as such she's had to make self-care a fundamental part of her life. One of the resources in her arsenal is a self-care marble jar. Sounds kooky, but the concept make sense. "I take a small glass jar — similar to the ones we use to can preserves — and place marbles in it. Each marble represents a moment or action that was taken to either restore the self/engage in self-care or contribute to the feeling of burnout or being overwhelmed," Dr. Mansour says. "Some examples of self-care moments at work include eating lunch (a working lunch does not count! ), sitting back in an office chair and closing one's eyes and other brief meditation techniques, prioritizing and writing to-do lists, getting up and walking around the block, delegating tasks, etc. Examples of times in which you would take a marble out of the jar are working through lunch, not taking a restroom break, continuing to look at the computer screen despite the fact that your eyes are burning, etc." "The idea is to keep as many marbles in the jar as possible," she continues. "When one is taken out, it serves as a reminder that a self-care moment is overdue." As creatures of habit who are more plugged in than ever (I'm waiting for the day they announce mobile implants for humans), it's hard to put down our devices and disconnect. But it's necessary — if you want to stay out of the looney bin, anyway. Jacel Egan, media relations coordinator for the blog TechnologyAdvice, suggests setting "...a firm time to 'unplug' and unwind — whether that's 5 p.m., 6 p.m., or 8 p.m — and stick to it." By doing this, she says, "you're making a commitment to yourself, your family, and your sanity to quiet the buzz in your head and recharge your batteries." I'm not one to go straight home after work, get in my jammies, and plop in front of the TV. Never have been. Instead, I prefer to stay active until just before bed time, engaging in all manner of activities, from meeting friends to going to the gym to preparing for the next day. I especially like nighttime activities, like a kickball league or bar trivia. These activities help me unwind — especially necessary if I need to blow off steam or aggression after a particularly rough day — so I don't succumb to burnout. Egan offers a few tips on how to make the most of your down time, with added motivation. "Incentive yourself by putting happy hour with a friend on the calendar, or plan a date with your significant other on a weeknight," she says. "Having things to look forward to can increase your productivity — especially since you're expected to be there at a certain time." Feeling overwhelmed? Is there too much on your plate? If you're behind, or if you feel like you're in danger of falling behind, delegate the work (if you have that luxury) before a small fire turns into a five-alarm blaze. There's nothing wrong with farming out work if you're in the position to do so, so long as everyone is contributing to the team equally. Those of you who feel like there's never enough time in the day — don't worry, I'm with you — might identify with this fresh perspective from Melissa Heisler, author of From Type A to Type Me: How to Stop "Doing" Life and Start Living It. "When I was working my nine-to-five job, I would wake up in the morning and immediately go through my to-do list and what I had planned for the day. The result was feeling behind the 8-ball before I even left bed," she explains. "One of the ways to release time's hold on you, before you get out of bed, say, 'I have more than enough time today to accomplish everything that I need to do.' Just making that statement changes your outlook on the day. This reframe empowers you to deal with the day differently and avoid burnout." I see this all too often from workaholics who complain about how stressed they are and how burnt out they are; they have plenty of accrued time off — but they rarely take it. It's hard to have sympathy for someone who has the opportunity to enjoy a break but doesn't seize it, and it's nobody's fault but your own in that case. If you have PTO or vacation time, then use it. When you start feeling burnt out, clear your schedule to rest, relax, and remember that the only way you're going to make it through the next two decades of work is to strike a decent work-life balance — starting today. Here's someone who can help you avoid burnout: your boss. There's no shame in letting him or her know that you might need a bit of breathing room to stay productive. "Most people are afraid to speak up for fear they will be immediately replaced by someone whose motivation isn't in doubt," says Harold Mann, owner of an IT consulting firm in San Francisco. "Here's what I recommend: Talk early with your supervisor. Mention you're not burned out, but you're concerned about the risk. Ask for suggestions or guidelines, mention the warning signs or indicators. If you're a great employee, they should work as hard as possible to keep you happy." Or, if you want to look at it another way: "It's less work than replacing you," Mann says. Do you have other hacks for avoiding burnout at work? Let me know in the comments below. I guess a good, well spent vacation is enough to refresh and recharge your worn out battery. Try to spend time on it at least once or twice a year and you should be good to go.